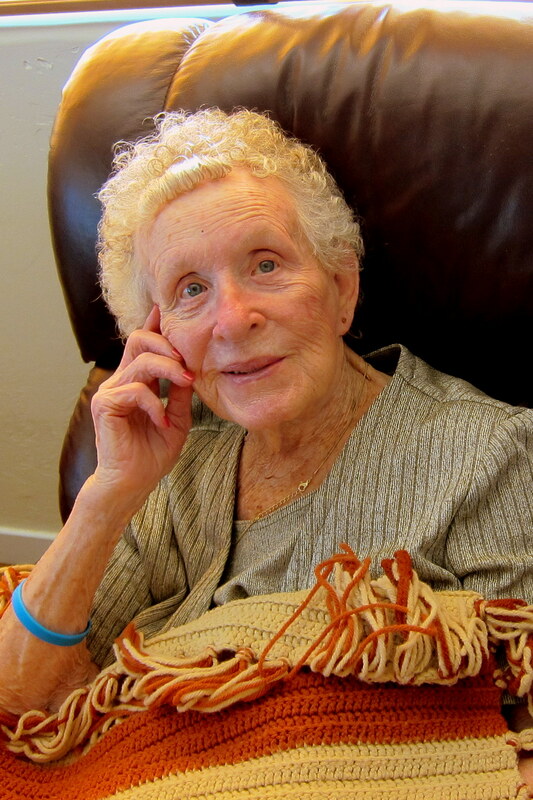 Thursday, February 24, 2011: Before leaving Tucson, we stopped for one last visit with mom. 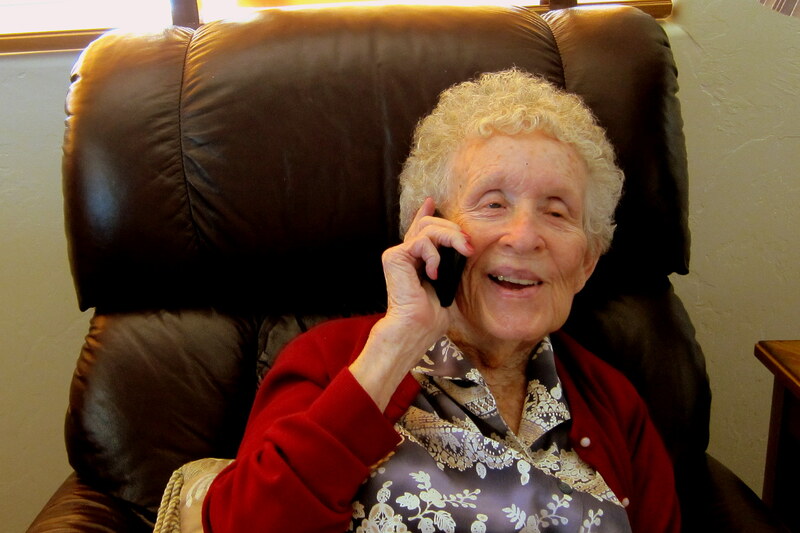 I took the opportunity to call many of her family and friends so she could chat. I would like to thank all who commented that my mom looked great. She does well on most days…..however she also has some bad days. The famous smile and twinkle in her eyes is still there and her long term memory is very good. We made frequent visits of short duration as she tires easily. Here is one of my favorite photos out of the dozens I took of her on this trip. After a great time in Tucson, Kit and I are indeed on the road again. After dumping tanks at RV Central ($5.00) and getting fuel ($5.00—-not really, but close) we jumped on I-10 heading north. We noticed a preponderance of RV’s heading in both directions on I-10. Big RV’s, medium sized RV’s even teeny tiny RV’s. The most we have seen on any stretch of highway anywhere…..everyone is apparently interested in going somewhere else. I-10 is also the cleanest stretch of highway we have seen in days. Not a scrap of paper or witches knickers to be seen anywhere. 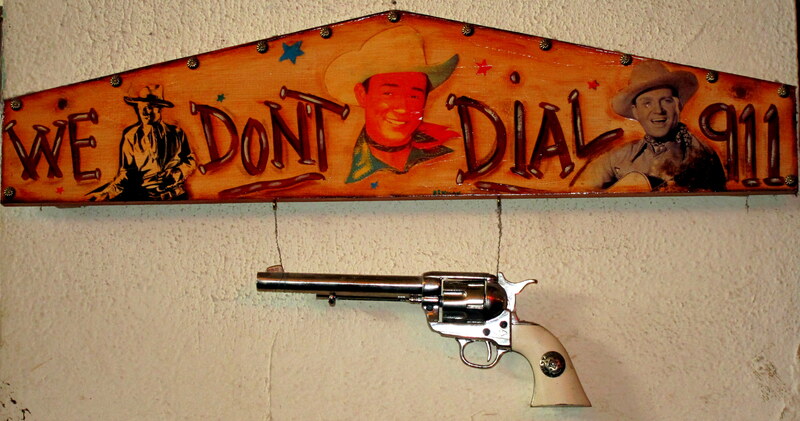 Remember, this is the domain of Sheriff Joe! Even litterbugs don’t want to be wearing pink jumpsuits and made fun of. Gotta love Arizona justice. 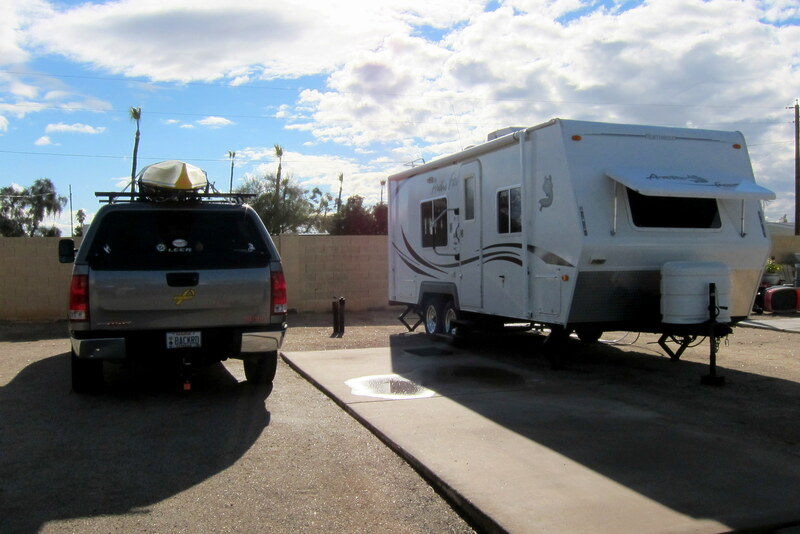 Arriving in Sun City, a bit north of Phoenix we decided to stay the night at Paradise RV Resort. The place in huge…..it has 947 sites and they only had two vacancies! We received a considerable discount on the rather high nightly rate because we were “Fillers”. Folks that are only in the park for a few days and agree to move to any available site to fill the park. Fortunately we only had to move once, an easy chore for us. The traffic in and around Phoenix was very heavy. Apparently this area is where about a half dozen professional baseball teams hold spring training, also known as The Cactus League. In addition there was a NASCAR race this weekend. Before turning in for the night we enjoyed homemade Tamales that Manny had given us as we left Tucson. They were incredible! 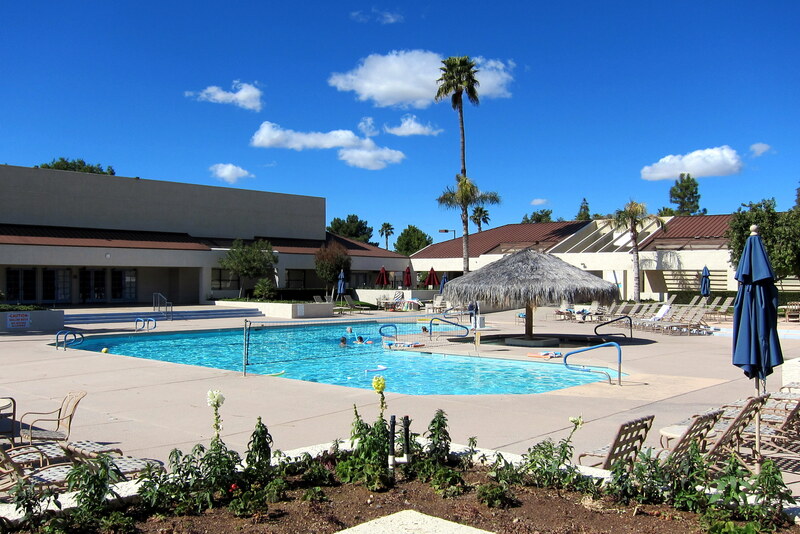 Friday, February 25 2011 through Sunday, February 27, 2011–Sun City, Arizona. 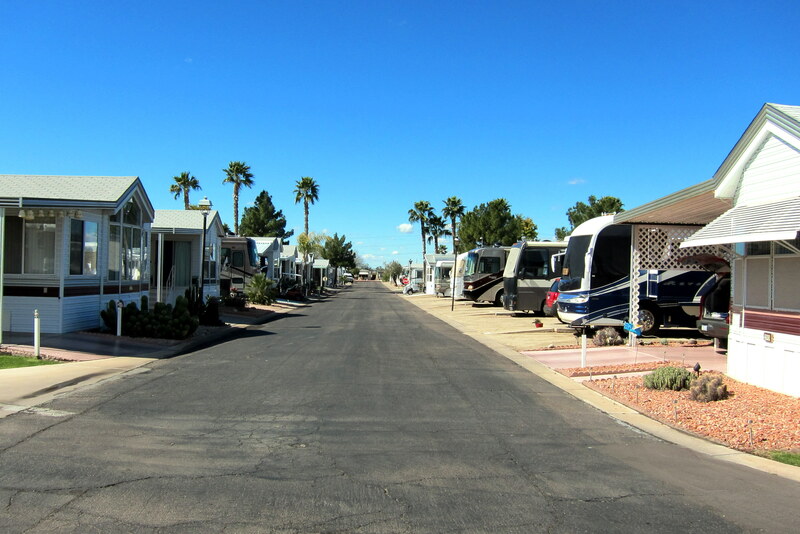 Paradise RV Resort is a full featured RV park that has all the amenities the discriminating retiree would want. There is a large activities center with many craft shops, a billiard hall, library, workout room, ballroom and a diner. In addition there is a nice pool area with two hot tubs. 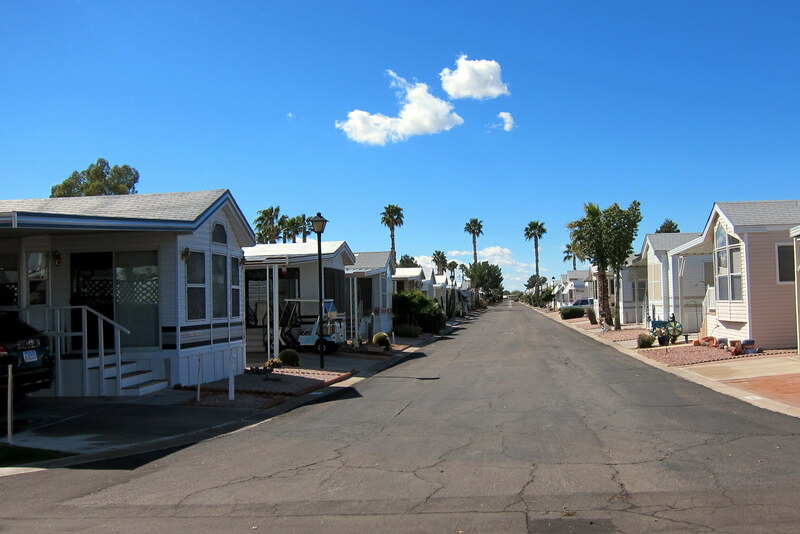 There are many Park Model Trailers set up on landscaped lots. 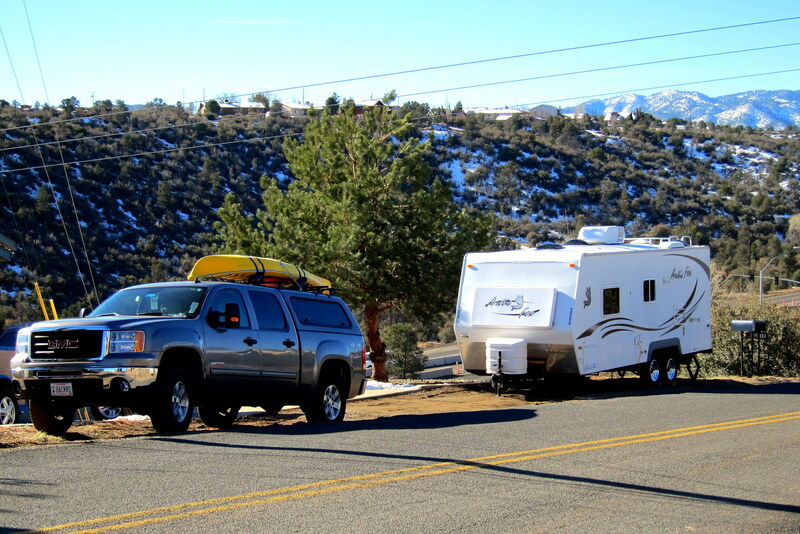 A number of lots that are owned by RV’rs where they park their high end motorhomes. And then there was us…..in the ghetto. No landscaping, no plastic lawn art and that puddle of water outside our door was our authorized swimming area. OK…..actually it rained a bit last night, an event for great celebration in this arid environment. 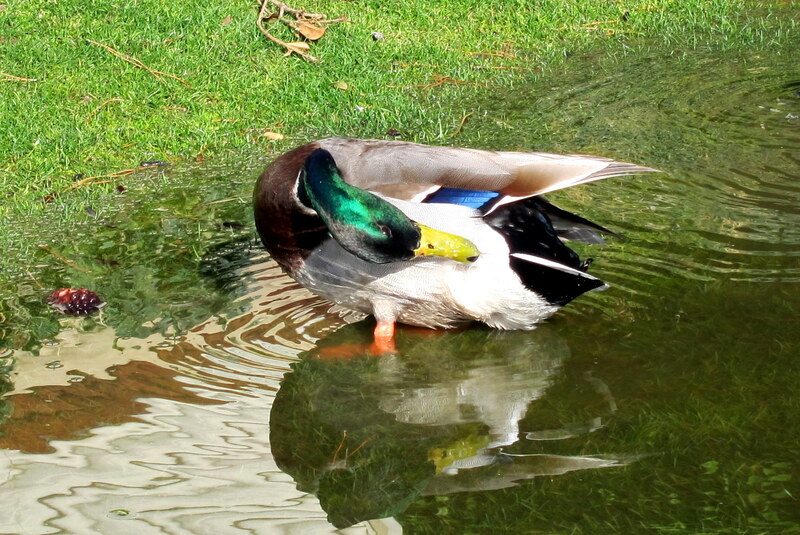 All in all this place was just ducky. We discovered that some square dance friends from back in Maine are spending part of the winter in the area. 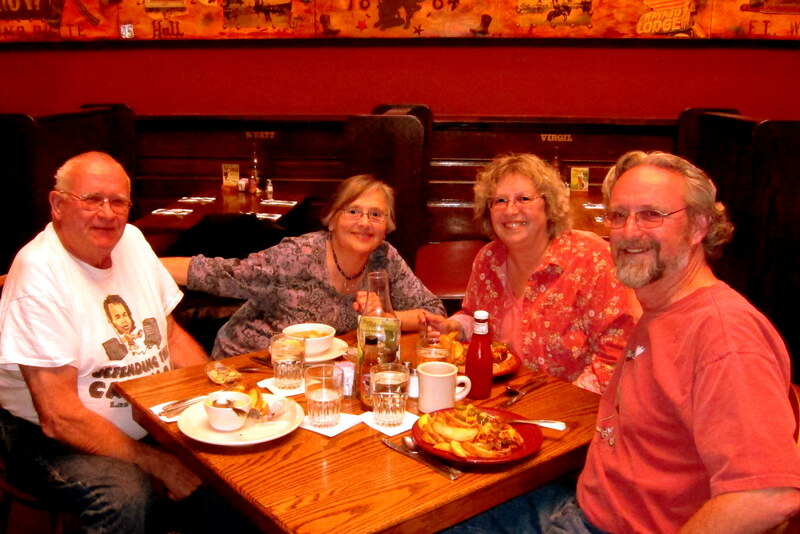 So we made arrangements to visit with Len and Bev over a delicious meal at the Claim Jumper restaurant. After a few hours visiting and enjoying the company of this delightful couple we headed back to Paradise. On the way we came across this car stopped at a light. Gee, I wonder what this guy does for a living? 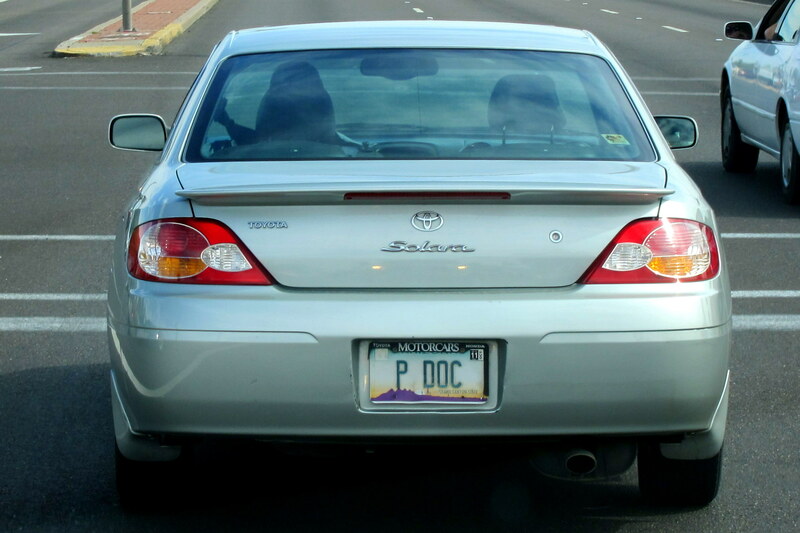 I bet he is one popular MD in a retirement community like Sun City. One of the main reasons for coming to Sun City was to visit an old friend from back in the old neighborhood. Martha is the sister of my best childhood friend, Rodney. And since I didn’t have a sister of my own, I helped Rodney aggravate his. Martha and her husband Tommy live in a very nice home on one of the many golf courses in the area. Her 95 year old father, Mr. O, lives independently a short distance away. Martha and Tommy invited us all over for a meal and to get caught up on the past 46 years. It was an unbelievable experience for Kit and I…..we were instantly transported back to 1965. Marti and Tommy are an incredible couple. She works at the local children’s cancer center and Tommy is a retired actor with many stage, film and television roles to his credit. Spending time with them and Mr. O was a thoroughly enjoyable and inspirational experience. 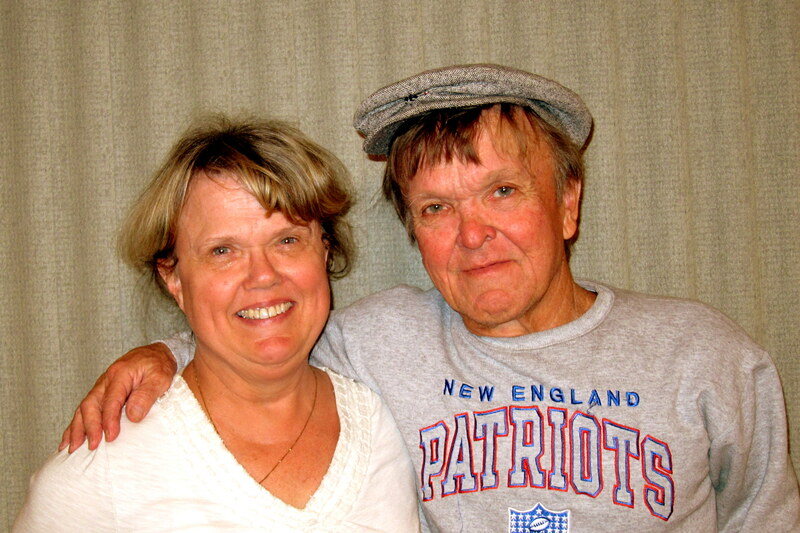 Tommy grew up in Connecticut so he and Marti occasionally make trips back east to visit relatives. We hope they take us up on our offer to visit us in Maine so we can continue getting reacquainted. Monday, February 28, 2011: On the road under clear skies and temperatures in the 60’s. We chose I-17 then AZ-69 to head north toward Prescott Valley, Arizona. This is the new hometown of another square dance couple from Maine, Charlie and Terri. Also there to greet us was yet another square dance friend, Mary, who had relocated to Prescott Valley as well. Charlie is a retired auto mechanic and Terri is a retired elementary school teacher. Mary works as a heart catheterization specialist at the local medical center. We had a great time visiting and talking about our shared interest in the activity of Square Dancing. Tuesday, March 1, 2011 and Wednesday, March 2, 2011–Prescott Valley, Arizona: Charlie and Teri have a beautiful home on a hillside where they enjoy incredible views of the valley and surrounding mountains. Being that the house is on a hill the dooryard surfing possibilities were somewhat restricted. However Charlie helped me shoehorn the trailer into a reasonably level spot. It is hard to tell from the photo above but the ground slopes off rather dramatically at the rear of our trailer. However the view out our window every morning was impressive. Yep folks…..that’s snow you see. 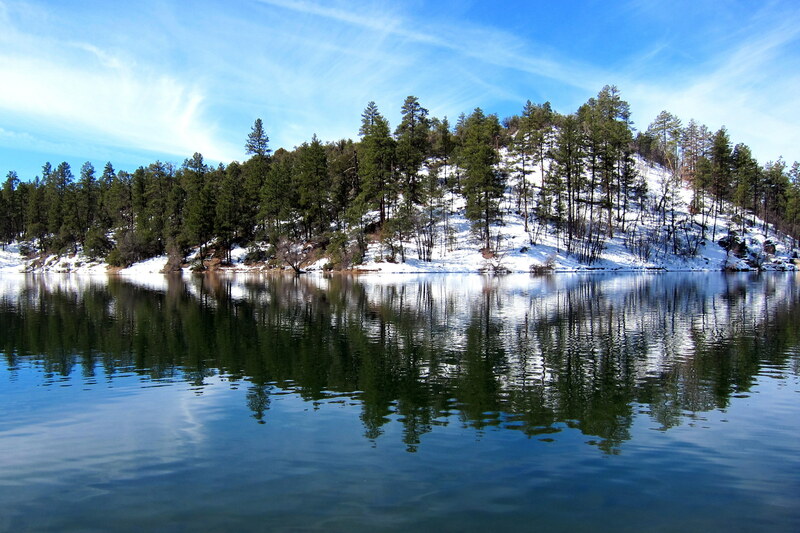 Even though this is Arizona, Prescott is in the mountains and snow is a fact of life. Fortunately the snow doesn’t accumulate much and the temperature rarely stays below freezing. There is a tavern in the older part of Prescott called The Palace. Legend has it that one day the town caught fire and the patrons of The Palace picked up the long wooden bar, carried it across the street and continued to drink while the building and most of the rest of the town continued to burn. After rebuilding the structure the original bar was reinstalled and is in use today. The Palace has an interesting theatrical history as well. 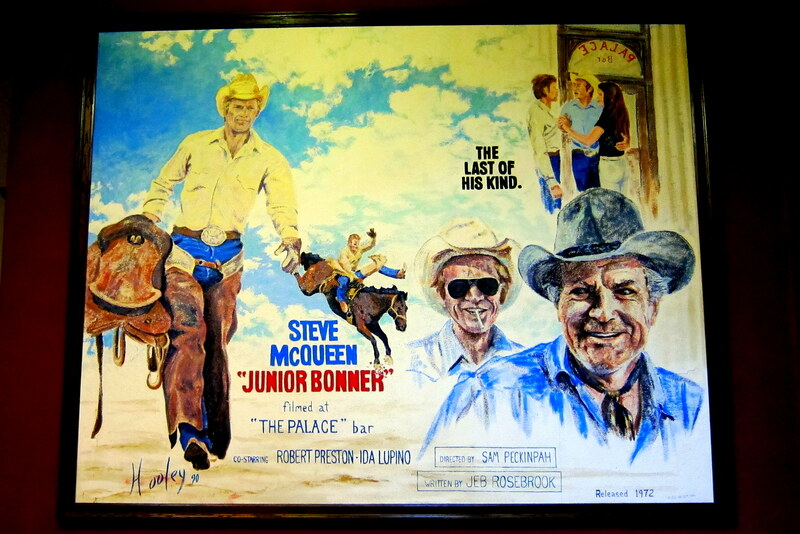 Many movies were shot in the bar, the most famous being Steve McQueen’s, Junior Bonner. 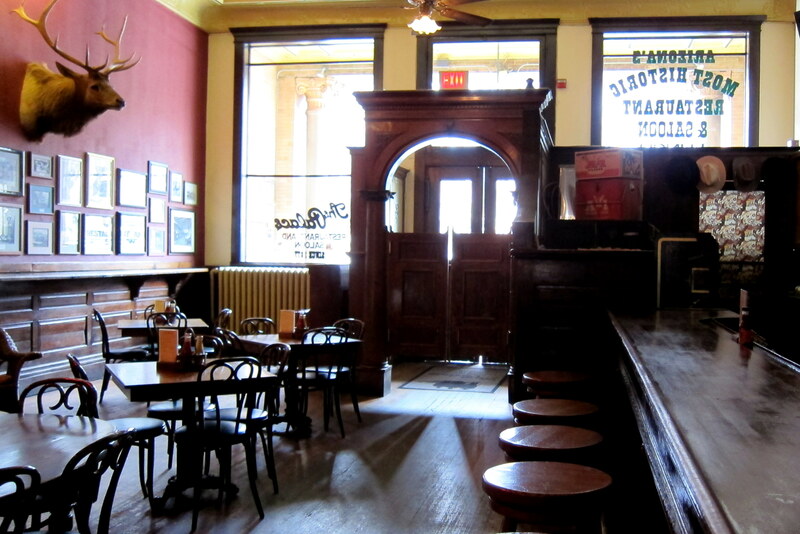 We enjoyed a great meal in a great historic old saloon with some great friends. On one afternoon, when Terri had a prior commitment, Charlie took us on a tour to some of the sights in the area. 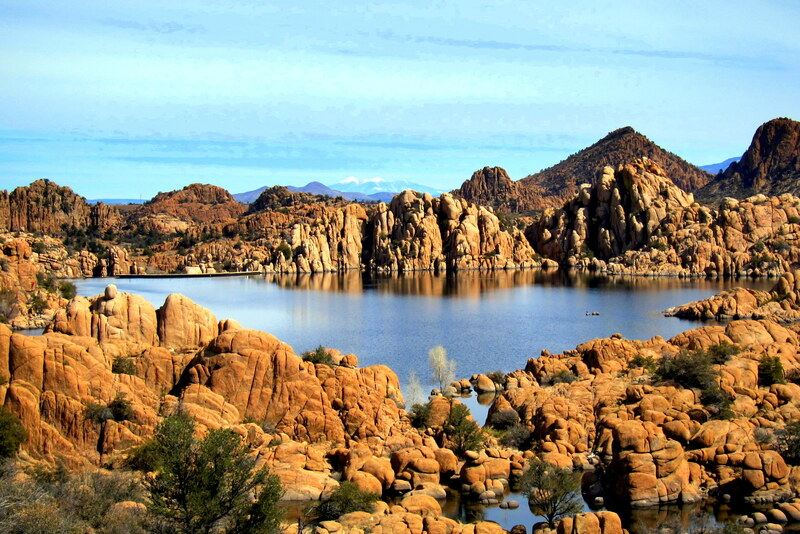 There are a number of lakes in and around Prescott. Many offer camping and have a reputation as being prime fishing spots. Lynx Lake is one such place. 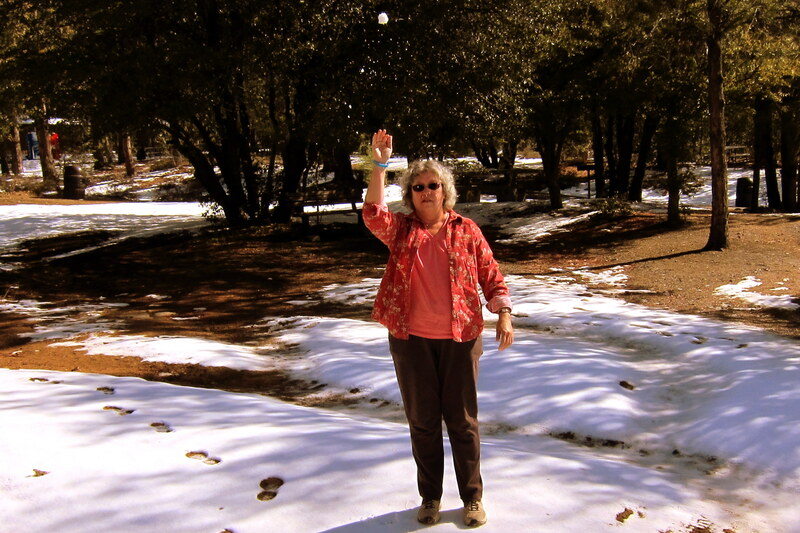 As I was taking Kit’s picture on the snowy shores of Lynx Lake I was wondering why that snowball was getting larger…..then it suddenly came to me. Another interesting body of water in Prescott Valley is Willow Lake. Great potential for some quality kayaking…..however not enough time on this trip. We will certainly return in the future and I will get my boat on these waters. There were many interesting rock formations that would be a blast to paddle through. Among the many critters in and around the lakes were these geese. The poor fellow on the right is called Hop-along by the park rangers. He is awaiting a replacement limb, probably taken from a Pinyon Pine tree. 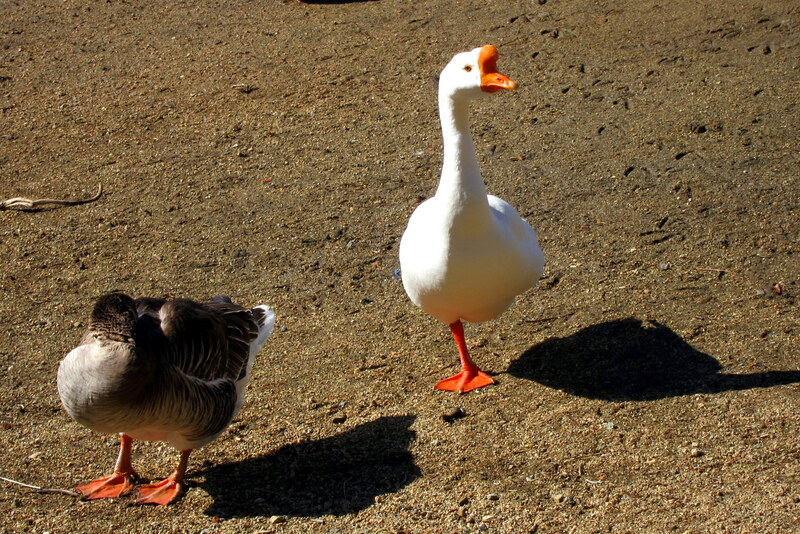 OK, just kidding, most of the geese on the particular day had one leg tucked against their body to retain heat. 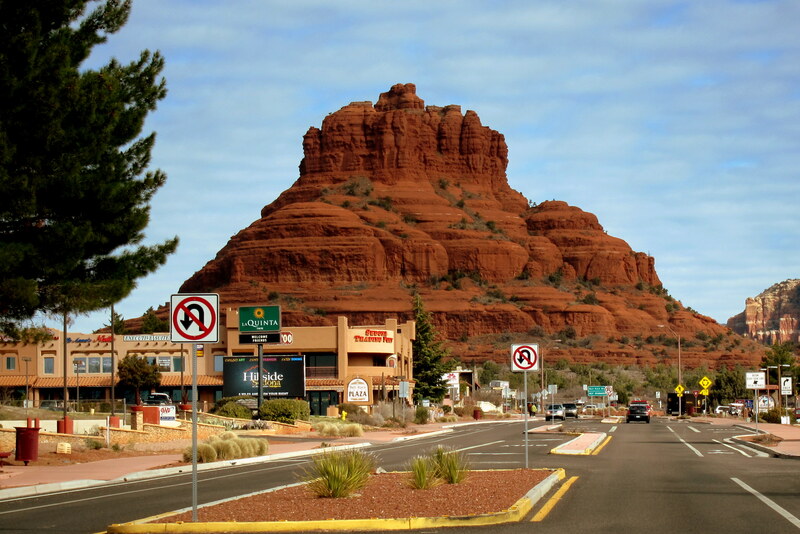 On our last full day in the area, Kit and I took a day to drive to the town of Sedona. This magical place sits at 4,330 feet at the base of the Colorado Plateau and features some of the most stunning natural scenery in the US. As we came into town we were met by this inspiring and breathtaking view. 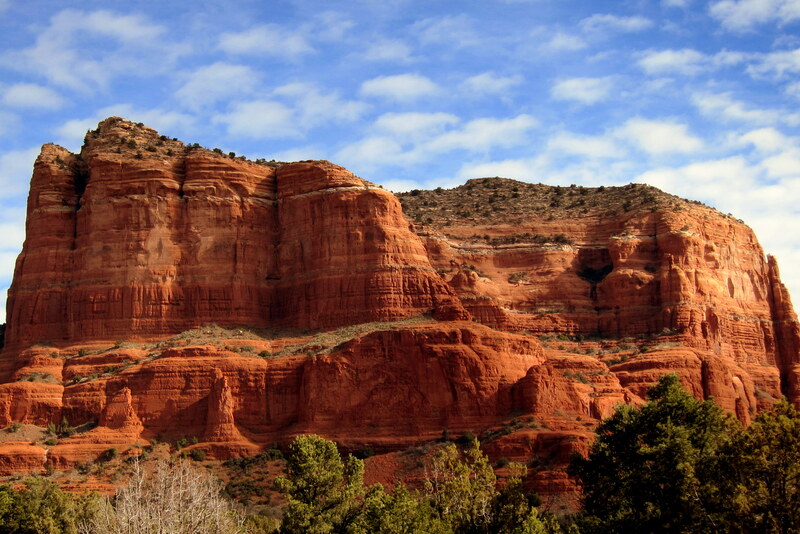 The brilliant red-orange sandstone formations are everywhere one looks. This below formation is called Cathedral Rock. The layer upon layer of stratified rock is a 320,000,000 year geological timeline. Fossilized sea creatures are frequently found in the sandstone layers. 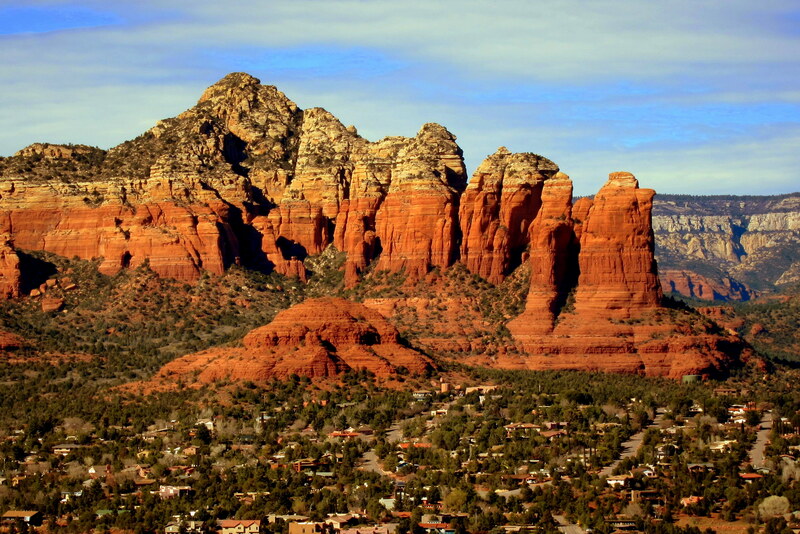 One of the most photographed formations is called Bell Rock, and serves as a landmark in town. Another interesting formation with a rather whimsical name is Snoopy Rock. Look for Snoopy lying atop his doghouse in the center of the below photo. 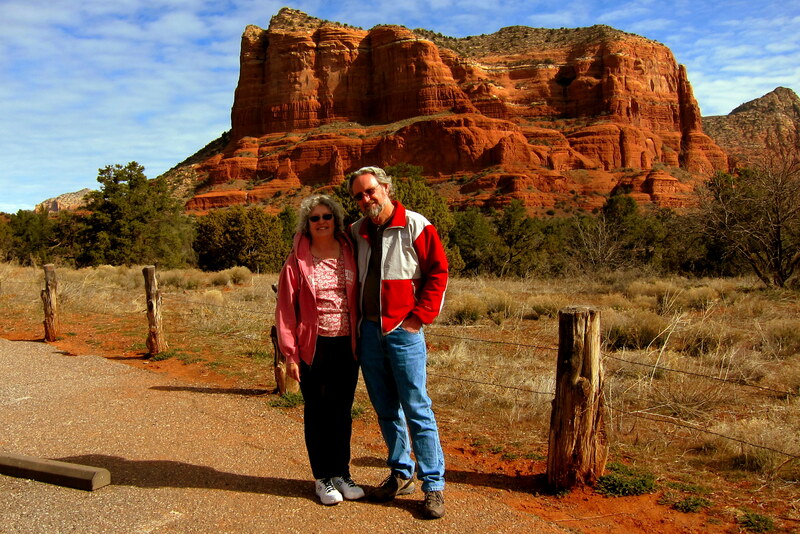 One reason we had such a great time in Sedona was that Terri gave us a list of must see and do’s for us to follow. Kit and I systematically followed her advice and I’m sure we enjoyed far more experiences than if we had been on our own. One must do was lunch at The Hideaway. As the name implies it is an out of the way favorite of the locals. The food, service, ambiance and views of the red rocks were fantastic! 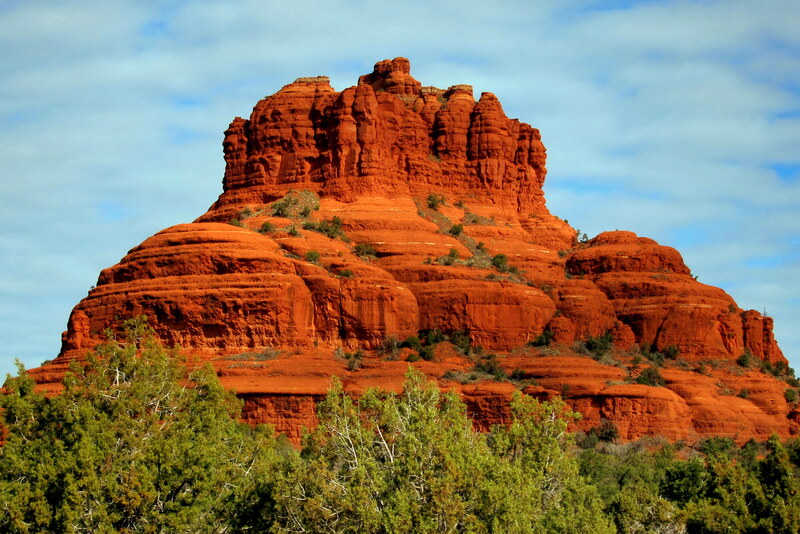 Sedona is home to the New Age movement and the famous Harmonic Convergence Vortexes. One of these spiraling energy forces is located on Airport Mesa where a commanding view of the town can be viewed. Mr. Bill, Marvelous Monkey and I sat at the epicenter of the Vortex energy field. We enjoyed its spiritual and psychic powers while our Aura was being cleansed. Kit however remained in town and shopped where she enjoyed herself as my billfold was being cleansed as well. I think I see her on the sidewalk in the lower right of the above picture. Wave at her…..can you see her shopping bag laden arm waving back? As the afternoon waned and we had to leave, we both promised to return and enjoy even more of this special place. 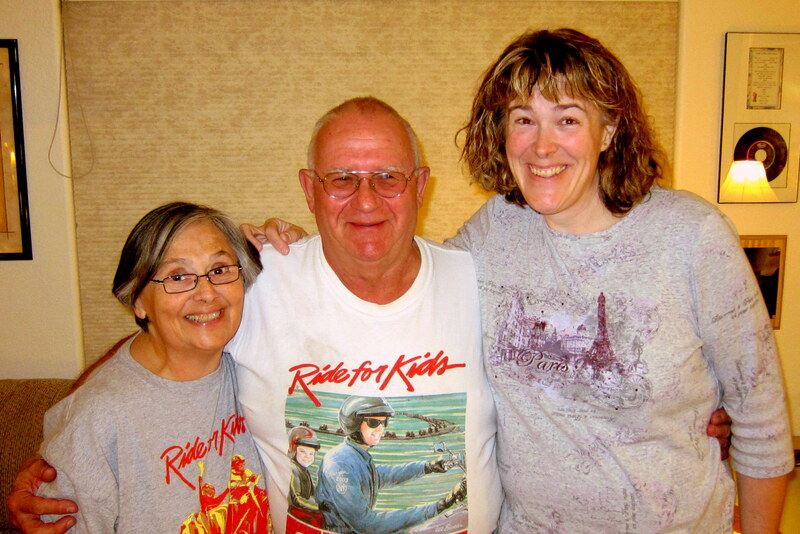 Kit’s Three Cents Worth: Reuniting with Martha after all these years was wonderful! She has such a zest for life and it was so much fun remembering all the mischief Bill and Rodney got into when they were kids. Mr. O got quite a kick out of it too and remembered things we had long forgotten. Meeting Tommy was great, too! We’ve heard about him and his acting career for many years; just had never had a chance to meet him till now. What a character he is! 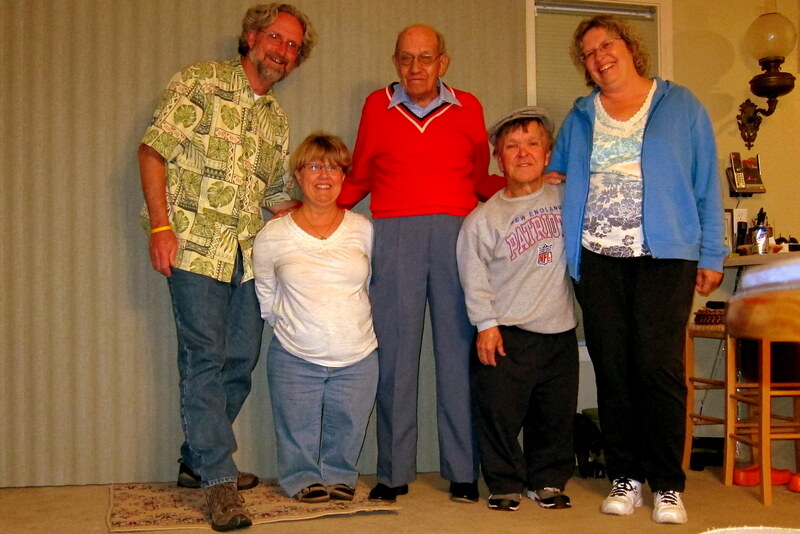 Also, lots of fun staying with Charlie and Terri and seeing Mary and meeting her mom, Cindy. We had square danced with them a few years ago and whenever they came back to Maine to visit they had invited us out to AZ for a visit. 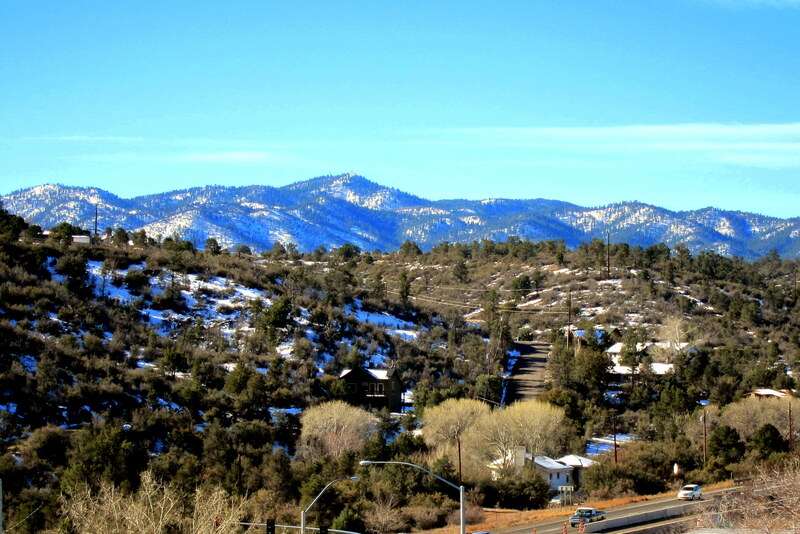 Love their new home and the entire area of Prescott and Prescott Valley! The year round temps there are comfortable and the town has lots to offer, wide open spaces, beautiful views and all the major stores one would frequent. A truly delightful place to live. I can see why many northerners make this their winter home! I hope the Vortex energy field that cleansed your Aura did not mess with your fabulous Mojo baby. Looks like good biking country too. My Mojo got done run over by my Karma. It was good biking country…..classic slickrock. 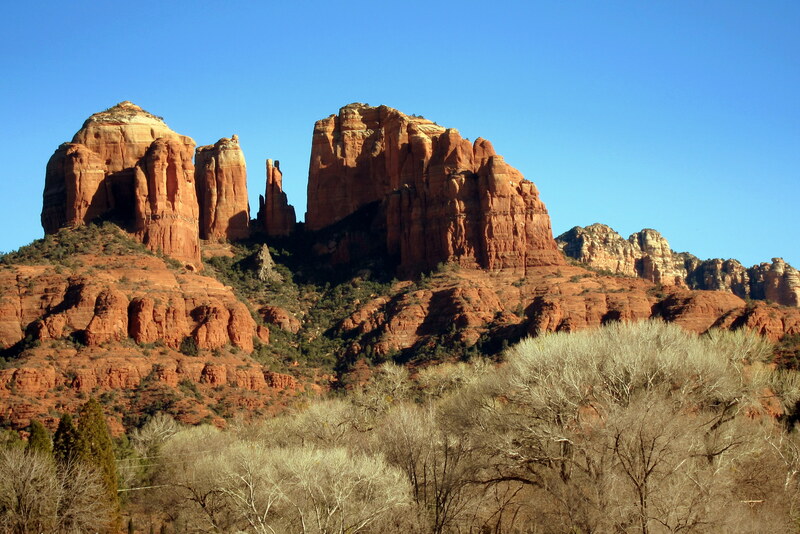 There were many multi use trails in and around Sedona. Didn’t see very many bikers however. 5 stars out of 5…..wow, pretty good, Thanks. It’s easy to like Tommy. Just wait till you meet him…..a unique experience awaits! Where was everyone in your Sun City views of the streets and pool? Perhaps it was siesta time? 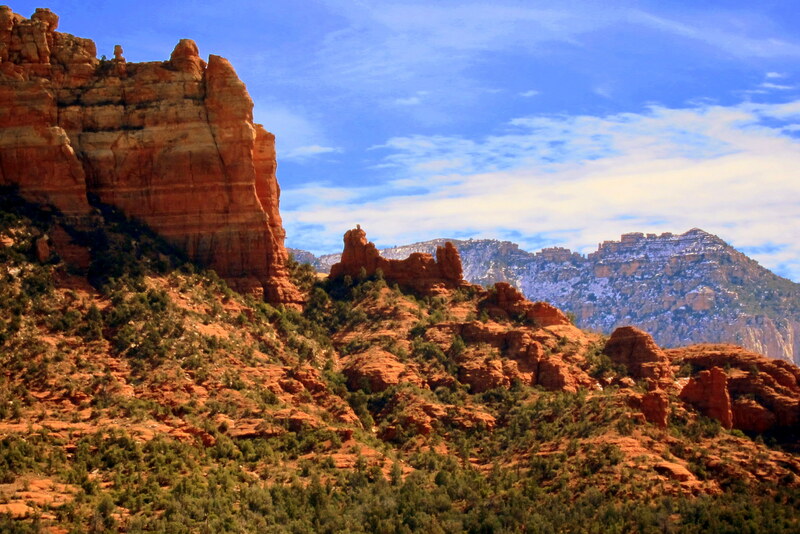 Great pictures as always—–I had heard that Prescott/Sedona were expensive places to live, but the scenery is breath taking. I know Kit was relieved that you finally cleaned up that aura of yours, she’s been complaining about it for years and has been dropping lots of hints. Thanks for taking care of that before you come to visit us! Incidentially, by those majestic photos you took, we can tell your camera got some cleansing too. You ought to go volunteer to show photos and share journals with some of the 5th grade classes in your area who study all the states. In fact, I have a teacher in mind if you want a connection. My aura is tarnished already…..gotta find me a pocket sized Vortex Energy Field. I’ll keep the volunteer school opportunity in mind…..thanks. I like the posts where you talk about the people from your past. Your mom looks great. I also remember Marti from John Paul Jones. Your pictures are great and I enjoy the commentary. Meant to tell you before how great Miriam looks. Much better than a couple of years ago. Bev and Len don’t look too shabby, either. You have so much fun and catch up with so many old friends (and making so many new ones) in your travels…the way life (in retirement) should be…lol. Thanks for the comment…..mom does indeed look pretty good for all that she has been through. However she has days that are not so good, all a part of the aging process I suppose. Take care, looking forward to seeing you in Maine this summer. 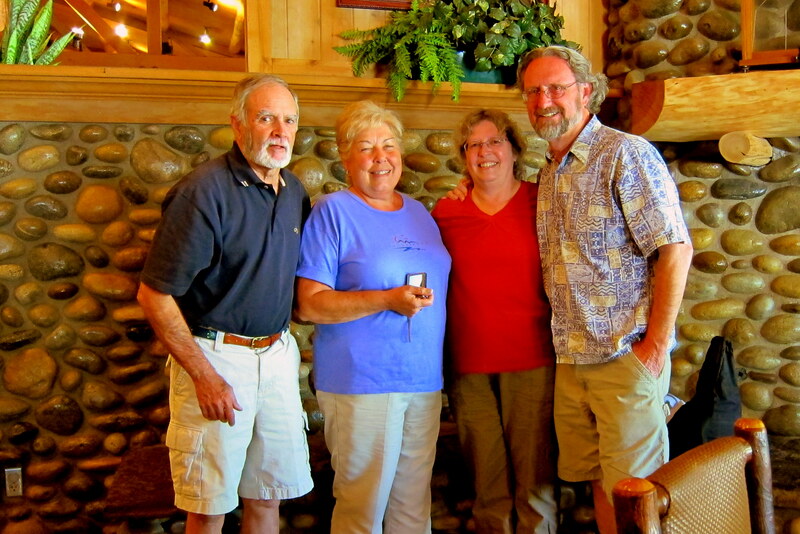 Just loved your blog on your visit to the Prescott area and your visit with Terri and Charlie, and Mary, of course. It was nice to see them since I haven’t seen for almost a year. We talked a lot on the phone though and I’m hoping to get out there again soon!